I've been rolling and scrolling with a SteelSeries World of Warcraft MMO Gaming Mouse on and off since 2008, scoffing at the baby hands of visitors that complained my pointing device was just too big. Turns out they might have been onto something. SteelSeries recently introduced the Legendary Edition of their World of Warcraft MMO gaming mouse, a streamlined version of the WoW-centric pointer that foregoes the sculpted design of its predecessors and looses a few buttons in exhange for a lower price point: $79.99 compared to $99.99 for its Cataclysm-themed big brother. Along with the button loss and sleek design, the Legendary Edition gaming mouse is also a great deal smaller than the two models that came before it, making it perfect for people that don't have hands similar in size to my giant pumpkin juggling mitts. Of course it's not the size of the mouse but the way you use it that matters. 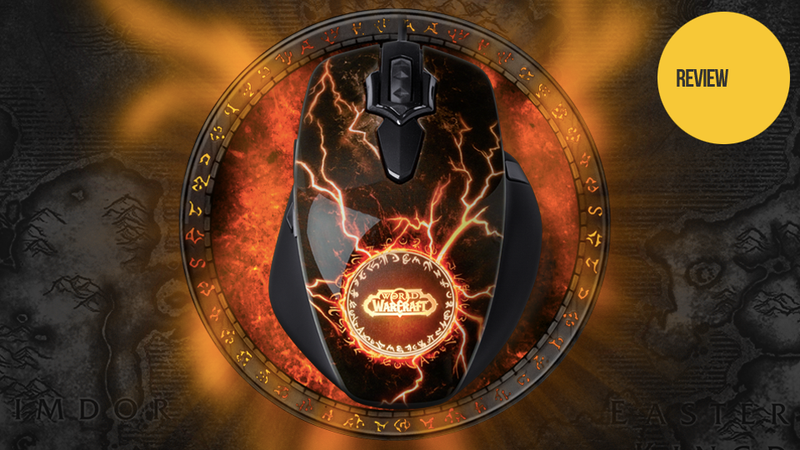 Stripped from it's WoW-fan pleasing package and plugged into a convenient USB port, the Legendary Edition of the World of Warcraft MMO gaming mouse is nowhere near as impressive as the original model or last year's Cataclysm edition. Where those more costly models featured plastic sculpted to resemble plate armor or the metal scales of the dread dragon Deathwing, the main surface of the Legendary Edition is one smooth piece of plastic with orange lightning arcing across its surface. It looks like someone took a normal mouse and attached a sticker to the top of it, creating a rather cheap look I'm not used to seeing in a SteelSeries product. Its gaudiness isn't aiding by the circular window on the palm rest, where LEDs capable of generating 16 million different colors are used to illuminate a rune-encircled World of Warcraft logo. Fiddling with the light's pulsing options and you get an effect not unlike the dice inside a Magic 8-Ball rising to the surface and then sinking, over and over again. On the previous model that logo felt like some sort of honor, signifying that these were special mice for a special people. The Legendary Edition has all the majesty of a neon bar sign. But we don't buy our gaming mice for the looks, right? Right? Okay, some of us do, but when the laser hits the desktop, we're not worrying about what mouse looks like. It's about functionality and feel at that point, and SteelSeries has both of those elements covered quite nicely. Once I adjusted to the mouse's smaller size the Legendary provided a comfortable enough ride for my clicking hand, the soft rubber finished sides make a lovely contrast to the slick plastic top. The eleven buttons—four on the left side, one on the right, and six on top—were all easily within my reach, and while developing an instinctual grasp of where each buttons was located took me a few days, it was definitely easier that figuring out the fourteen buttons of the earlier model. The one sticking point, pun slightly intended, was the primary face buttons, AKA mouse 1 and mouse 2. Designed as an extension of the mouse's top shell, the left and right mouse buttons required a great deal more force to register a click than I am used to. This is both a negative and a positive; negative in that I'm used to more responsive buttons; positive because it's the only one of three mice on my desk that I don't start accidentally clicking when dozing off during a marathon gaming/writing session. It's about functionality and feel at that point, and SteelSeries has both of those elements covered quite nicely. The real meat of the Legendary Edition gaming mouse is found in its World of Warcraft themed configuration utility, a toolbox for tailoring the pointing device to your specific character's needs. With more than 130 preset game commands ready to be transformed into custom macros and ten profile slots, even a novice player can easily up their game in a matter of minutes. Along with building macros (or creating them from scratch using WoW's in-game macro scripting language), the utility also allows users to adjust the sensitivity of the mouse (up to 3,200 counts per inch) and, of course, change the color of that stupid glowing circle. The three-button difference between this unit and the Cataclysm model didn't cause me any headaches, but then I'm an Arcane Mage, and we only need five buttons tops to be effective. Though its reduced button count and sensible design make it suited for any pointing task put before it, the SteelSeries Legendary Edition gaming is a product aimed squarely at World of Warcraft players, in case the glowing logo wasn't enough of an indication. With so many veteran players complaining about how the game is slipping deeper and deeper into easy mode with each new patch, it makes sense they have an easy mode mouse to go along with it. The Legendary Edition World of Warcraft gaming mouse is a nifty little device, packing most of the funtionality of its forebears into a smaller and sleeker form factor more suited for people with smaller manipulators at the end of their arms. With only $20 difference between this model and the much more striking Cataclysm unit, why not drop the extra dough on something truly legendary? The SteelSeries World of Warcraft MMO Gaming: Legendary Edition is available now in the SteelSeries online shop for $79.99. Unless your hands can't handle it.